An unknown cataclysm thrusts the heroes into the Boneyard, where souls are judged after death... but the heroes aren't dead! Trapped in a tomb that isn't their own, they must use their wits and might to escape. The grim and otherworldly psychopomps who serve as the shepherds of souls are divided on what to do with these unexplained arrivals. The heroes must negotiate treacherous psychopomp politics and journey through a landscape of gloom and nightmare before walking the Dead Roads that can lead them home! 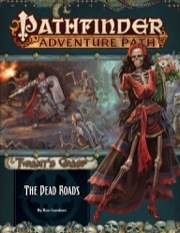 "The Dead Roads," a Pathfinder RPG adventure for 1st-level characters, by Ron Lundeen. Tips, tools, and tricks drawn from the Boneyard and its grim denizens, by Matt Morris. An exploration of races inevitably linked to death, including dhampirs, duskwalkers, mortics, and shabtis, by Mikhail Rekun. An extensive timeline of the events leading up to the Tyrant's Grasp Adventure Path, and insight into the true nature of the Whispering Tyrant's new weapon, by Crystal Frasier. A bestiary of monsters drawn from the lands and lore of the dead, including a skeletal tree that protects the spirits of the dead, a voracious extraplanar parasite, a leader among the malicious tooth fairies, and people who straddle the line between the living and the dead, by Ron Lundeen, Kyle T. Raes, and Mike Welham. Let me start by saying that The Dead Roads is not for everyone. Terrible tragedies will occur, and you won’t always be able to prevent them. These events are bound to have a lasting effect on your characters, so players should be prepared to consider and role-play the marks left by the trials you face. Plenty of the imagery and events in this adventure are dark, morbid, and sorrowful. It’s definitely a horror campaign — though not your typical horror. It’s suspenseful mysterious horror, with a touch of survival horror, and a good deal of body horror in the first book, as well. The Dead Roads contains imagery that is inappropriate for children and some adult gamers will even consider an image or two disturbing. It’s definitely not a campaign I could play with my family. That said, I loved The Dead Roads. Absolutely, positively, adored it. I wish that the maps of the various Dead Roads locations were given a bit more space, though. Squishing three multi-floor maps for three different locations onto one page is good for page count, but makes some of the maps difficult to read. Part of the eastern end of the ‘Palace of Teeth’ is nearly lost in the creases of the binding, while the entrance to ‘Salishara’s Scriptorium’ is hidden in the creases. If both of those maps were a few grid squares further to the left that would have been less of a problem. Finally, flipping back and forth between the map page and the various locations depicted in it (which is spread out over 28 pages) is a bit irritating. Have a bookmark or post-it note handy and try not to tear your pages. Much to my surprise there was also two player handouts which represent puzzles the group comes across. I’m really glad they’re depicted instead of just described. They’re necessary and a really nice touch. The Dead Roads starts with a bang (HA!) and doesn’t let up. The entire opening has the feel of an ominous, suspenseful mystery. Your PCs don’t know where they are, how they got there, or what’s going on. Their locations hide clues to both their situation and the history of wider events, which the PCs may or may not be able to uncover. In time they will discover the answers to some of their questions, just as they realize it’s tied to an even bigger mystery. There’s a lot of wonderful social encounters and NPCs in this adventure. Among them, three particularly stand out amongst the crowd: interacting with the townsfolk of Roslar’s Coffer is poignant and amazing; speaking with Barzahk the Passage; and — my personal favourite characters — Umble and Thoot! This pair of friendly psychopomps are the best! Many of the creatures and NPCs you come across don’t look friendly — which doesn’t mean they aren’t friendly. Of course, it doesn’t mean they are friendly, either. Which I love! Appearances often have no bearing on what a creature acts like and I appreciate that this adventure used that so effectively. It’s bound to throw players for a bit of a loop and make them feel… off-kilter. Which is great! There’s a lot of challenging encounters in this adventure and plenty of unique monsters to face off against. I particularly enjoyed that so many can end in ways other than violence. But, don’t let that last sentence lull you into a false sense of security! There’s a lot of combat encounters in this book that cannot be avoided. The rest of what I have to say is heavier on the spoilers, so read on with caution. Through this adventure the PCs will get to interact with psychopomps, a type of outsider native to the Boneyard who work to ensure that the processing of souls is done accurately and efficiently. Typically functioning as guides for the souls of the deceased, the psychopomps are confused over what to do about the mysterious PCs. Some will help them along their way and others with hinder them. Psychopomps aren’t the only enemies and NPCs the players will interact with. The Boneyard is a huge realm, and there’s plenty of creatures living/stranded/invading there. Other major groups of enemies include fey, vermin, sakhil, and nightmarish beings from the Dimension of Dreams. I really enjoyed that they was such an array of different being to tackle, and the reasoning behind them all. This adventure consists of four main parts: Awake in Roslar's Tomb, where your PCs find themselves entombed in someone else's mausoleum and have to escape and figure out what the heck's going on; Among the Dead, where your PCs realize that their home town was destroyed in an instant and they are the only survivors. They need to head into a phantom version of their hometown and convince the citizens to move on peacefully to the afterlife. This is a great opportunity for GMs and player to get some great, emotional, unique roleplaying in and it's definitely my favourite part of the adventure. From there the PCs need to embark on a journey along The Dead Roads in order to return to the land of the living. Along the way they'll need to get their metaphorical passports stamped at three waystations. Each of these locations is suffering through some turmoil at the moment and is much more dangerous than expected. The Palace of Teeth is a delightfully disturbing castle ruled by warring factions of tooth fairies. It's my favourite section of the Dead Roads. There's also the puzzle-filled Nine-Eaves which has been overtaken by sahkil and the nightmare haunted Salighara's Scriptorium. The Scriptorium is definitely the most 'horror' themed location in this adventure. Finally, the PCs are confronted by the psychopomp Mictena who believes she needs to remedy the PCs death and help them move on to the afterlife. They'll face off against this psychopomp, her gardeners, and her friends. I was happy to see that words can win the day in some of these encounters, potentially even against Mictena (though odds are slim your PCs can make the DC on that). In addition to The Dead Roads adventure, this volume contains two articles intended for both GMs and players, one article solely for the GM, a campaign outline, and a bestiary containing five new creatures. Tools of the Boneyard is packed full of new gear and character options aimed at dealing with the dead. There is one alchemical remedy, one alchemical tool, and two alchemical weapons — bone burn is my favourite, so be sure to check it out! There are two new special materials useful for crafting — cryptstone can be used for ammunition and weapons, while spiresteel can be used for ammunition, weapons, and armour. Finally, there are five new magic items. Although I enjoyed a lot of the items, it’s the character options that I found were most exciting. Graveslinger is a gunslinger archetype that specializes in combatting incorporeal undead. Soul Shepherd is a monk archetype that can calm incorporeal undead and haunts with a touch. They also gain some otherworldly resistances and interesting ways to use their ki. Reaper is a new oracle mystery which I really enjoyed. Tightly themed and flavourful it’s capable of both killing the living and destroying undead. There are also six new barbarian rage powers including the psychopomp totem powers. The second player friendly article is entitled The Half-Dead. This section talks about four races that have a strong connection to death and the undead. In addition to providing details and character options for dhampir, duskwalkers, and shabti, it also talks about the new subtype of creatures, mortics. Dhampir appear alongside two magical items, duswalkers have access to five new feats, and shabti have access to five new feats. I was particularly excited to see shabti included. The next article, To Exceed Their Grasp, is written by Crystal Frasier and intended for GMs only. This article discusses some of the important concepts, characters, and events of the Tyrant’s Grasp Adventure Path and the role they play in the overarching story. It also contains a timeline. This is incredibly useful for GMs an will likely be referenced throughout the entire Adventure Path. There are five new creatures in the bestiary. All of them have ties to death and the Boneyard and two of them are featured in The Dead Roads adventure. Bonewrought Willow is an ominous looking intelligent plant capable of growing in Boneyard. Attracted to light and more benevolent than it appears this is a great CR 3 creature I can’t wait to confront my players with. Kaicherak are nasty little fanged worm beasts with ties to Achaekek and a fondness for messily gorging themselves on blood. At CR 4 they are among the most powerful new creatures in the bestiary. Mortics are living beings with strong connections to negative energy which makes them sort of like living undead. There are two mortic stat blocks included in the bestiary — the ghoulish elf-like angheuvore (CR 2) and the incredibly flexible halfling-like jitterbone (CR 4). As previously mentioned, more information on mortics is also included in The Half-Dead article. The final creature is the tooth fairy monarch, a CR 3 version of the lowly tooth fairy. The last article is a campaign outline that briefly details the events of the upcoming volumes of the Tyrant’s Grasp Adventure Path. Not the sort of thing you want your players peeking at! The campaign outline is incredibly useful for GMs (obviously). Overall, I loved this whole book. Cover to cover. Adored it. It's dark, morbid, mysterious, emotional, and really unique. Absolutely top notch. This book is a masterpiece, but I find its description to be misleading. While you deal with psychopomps several times, a good share of the adventure is classic dungeoneering, with some foes you might not expect in the Boneyard. Further, the campaign is called out to be survival horror - at least from reading I didn't get the impression, have to agree with Marco here. That said, the book has a LOT of cool ideas and RP hooks. Convince your fellow villagers they are dead now, get advice from a speaking portrait, loot wine bottles from other worlds, face a reluctant foe who tries to frighten you away with dropped notes and maybe convince the final villain to just let you go - this adventure has it all. And while you might consider tooth fairies totally out of place in such a plot, it's impressive how much the author got out of their theme. I looked forward to this AP due to its theme. The opening is different from what I expected, but it's still pretty good. Even if I never make it to GMing it, there is quite a bit of great inspiration here. Further, there are several character options: Two archetypes, a mystery, some rage powers, a handful of duskwalker feats and finally four shabti feats. Personally I like the chance to become immune to paralysis as a barbarian (on top of the other immunities during rage, at high level) and the shabti feats. Finally, the book has the usual Bestiary entries, with the usual high quality. The only flaw is the missing art for the halfling mortic. 3.5 stars - very little survival horror, colorful afterlife characters. Part 1 does a good job of bringing over the "awaking bodily in the afterlife" feeling. Part 4 is a good example of "fighting your way out of the clutches of death & has a great map. All three articles are well done & useful. Angheuvore mortics have a great backstory. Part 3 with lots of fey & vermin doesn't feel right in the realm of the dead. The adventure path is advertised as "survival horror", but at least this book has very little of that. While this adventure isn't bad in any way, it isn't a strong opening either. So the heroes are not dead and have to return to live, but they are alive and bodily inside the realm of the dead - interesting. Having very much liked Starfinder AP#7 from Ron Lundeen, i am very excited to see the opening of a Pathfinder AP written by him. Was there ever a book one by Ron (i only remember later books being from him) or is this the first? Nope, this is my first Chapter 1 to an AP. Now, the only chapter I haven't written for Pathfinder AP is a Chapter 4 (Although I wrote Chapter 4 for an upcoming Starfinder AP). Are the PCs dead? Or not? That's a question likely to puzzle them, as well! What do rebel spirit guides wear when they are young? That would be nice, but it doesn't seem to be connected to Geb, judging from the temporary descriptions from books 1-3. Any word on if we will get PF1 info on Arcadia ? I think Logan Bonner mentioned (in this past Friday's Twitch) that there is a visit to Arcadia somewhere in this last adventure path. Yeah I think we'll know by about...book 5 or 6 maybe? I doubt we'll know before then. Arcadia seems like an odd stop for this AP, but I'll not complain! They will join us or die. Then join join us in undeath. Is this going to be PF Classic or PF 2.0? This is the last PF Classic adventure path. Excellent. I showed the blurb for the first chapter to my regular group and one of them took money out of his wallet and threw it at me. I take it that's a strong yes for doing the AP. Part 5 will have a quest to Arcadia, to find a weapon made by Arodon. It's to include a double gazetteer on Arcadia. James Jacobs confirmed that Arazni is /heavily/ involved. Yes, AP#143 explicitly mentions Arazni. I also think she will show up in the final volume #144. Can't wait to see how the PCs begin in this adventure path. Will they be from Lastwall or just at the wrong place? Inquiring minds want to know. "The heroes awaken already defeated—slain by a superweapon unlike anything seen before on Golarion." Boneyard, I guess. That's what the developers have been saying, right? They are going to be dead. Can't wait to see how the PCs begin in this adventure path. Will they be from Lastwall or just at the wrong place? The last AP was updated on november 1st, so this should hopefully be updated on monday. Just about ready to cut my Pathfinder AP subscription. They can't possibly have any new interesting APs coming out..
Crap.. they just got another 6 months worth of money..
To be fair, this will be the LAST of the APs for 1st edition PF. So any chance the cover art on some of these will be getting updated soon? Or a book 6 product page? or which Iconics are in it? Updating the cover images and adding the final volume aren't something that are in my control, so I'll leave that to the folks who handle those things so well. But I can say which iconics are in it: Imrijka, Kess, Seelah, and Yoon. Was expecting Im and Seelah, but not Kess and Yoon. Nice! Huh, seems like this will have new race called mortic? Chris is getting statted up? And they seem to be in the bestiary as well, or at least I suppose that "people who straddle the line between the living and the dead" sounds like a good description for a new half-undead race unrelated to vampires. Sounds promising. Nastier tooth faeries? Oh noes. Do the PCs know each other before the start of the AP? If not it sounds like Tyrant's Grasp will, ironically, be easier to work a Samurai or Ninja PC into than Jade Regent. Wonder if that's intentional actually. It's the last (PF1E) AP, so I could totally see the design team intentionally making it friendly to the PCs playing whatever they wanted to. Good to see Yoon get an AP of art before she vanishes into the ether of an edition change (and even if she ever returned, would be aged up). Yessss.... first Paizo article with my name exclusively on it. And it's about dead things! Marvelous! Wonder how the Mortics differ from Duskwalkers ? Probably, they aren't outsiders or maybe they are actually half-undeads.